HTPC users are finally catching up to the folks that picked up the Boxee Box. Folks that use Boxee software on their PCs and Macs have been largely ignored since the launch of the Boxee Box. It makes sense of course, since Boxee software is free and the Boxee Box brings in the cash. With their newest release, the folks at D-Link and Boxee have found a way to please PC users and turn the free version into a profitable business for themselves. That product is a Boxee remote control that can be used on Mac and PC. "The Boxee Remote Control was one of the most talked about advances with the Boxee Box by D-Link," says Boxee's Andrew Kippen. "We're excited to bring it to all of the Boxee users who've built customized home media centers and want to get even more out of their Boxee software." 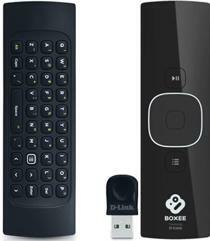 You can pick up the Boxee Remote Control now on Amazon and various other online retailers.